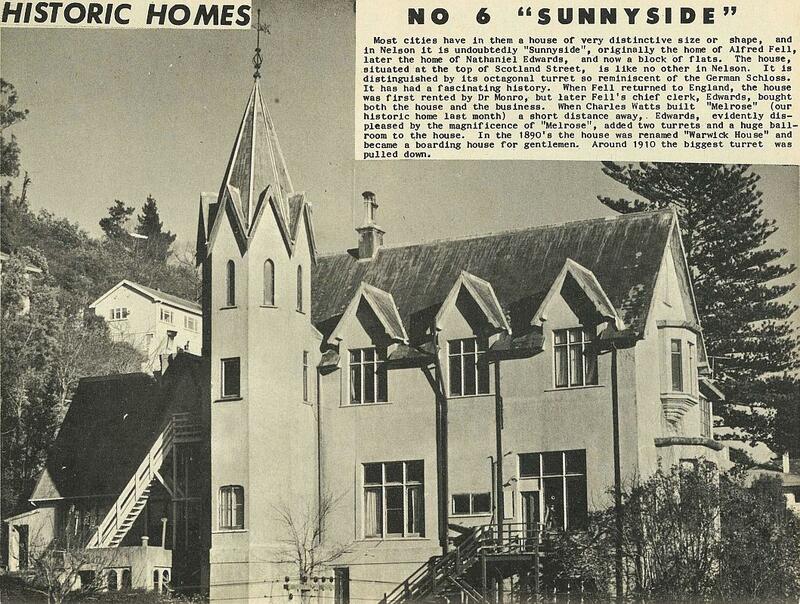 Most cities have in them a house of very distinctive size or shape, and in Nelson it is undoubtedly "Sunnyside", originally the home of Alfred Fell, later the home of Nathaniel Edwards, and now a block of flats. 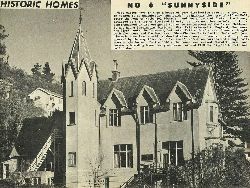 The house, situated at the top of Scotland Street, is like no other in Nelson. It is distinguished by its octagonal turret so reminiscent of the German Schloss. It has had a fascinating history. When Fell returned to England, the house was first rented by Dr Monro, but later Fell's chief clerk, Edwards, bought both the house and the business. When Charles Watts built "Melrose" (our historic home last month) a short distance away, Edwards, evidently displeased by the magnificence of "Melrose", added two turrets and a huge ball-room to the house. In the 1890's the house was renamed "Warwick House" and became a boarding house for gentlemen. Around 1910 the biggest turret was pulled down.